and shared for years to come. Some presents really are special. 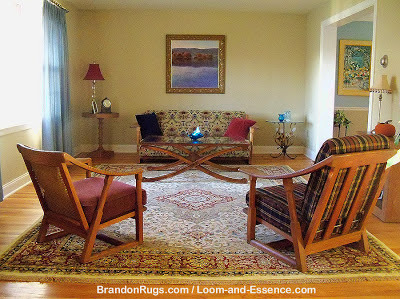 The fine hand-knotted oriental rug in the picture below was the coup de maitre (and sine qua non) to the newly redecorated living room of our talented customer. She had, over many months, painstakingly selected and collected (and in some cases repaired or refinished) every element of new and old decor in the room. 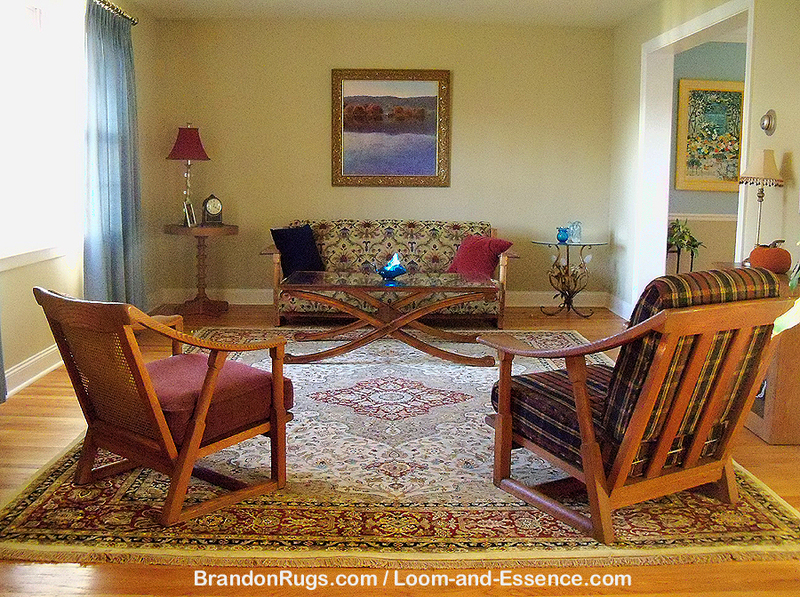 Upon bringing it all together, she saw the need for a rug to anchor and integrate all of the other elements. She invited us into her home to see what she had accomplished, and asked us to help her find a rug that could appropriately finish what she had so skillfully brought to the finish line. 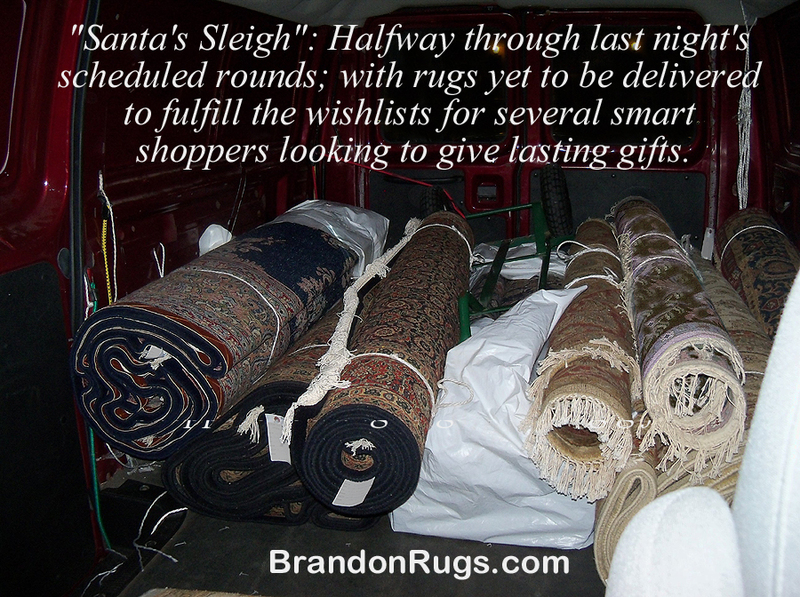 With the good fortune that helps every great rug find its true home, we knew of this rug, were able to acquire it for our customer's approval, and helped her to complete her picture perfect room. Using some video shot after we'd installed a matched set of runners on the split stairway in our customer's new home, we demonstrate proper installation guidelines. First, we want to make it obvious that REAL hand-knotted runners, which are bordered on all four sides, offer a much more aesthetically pleasing finished look than"roll runners" -- machine made runner stock spooled on large rolls and cut to desired length -- which are bordered on only two sides (and look like a conveyer belts from space to some lower level instead of like framed works of art). We also demonstrate our preference for using "stair-holds" or runner "clips" to secure the stairway runner to each tread rather than the use of stair-rods crossing the runner at the back of each tread. The reason for this is that the runner clips allow the runner to be the focus instead of a lot of brass. It's also safer, since rods can be a trip hazard to women descending the stairway in heels. The clips also make it easier to keep the runner clean, and cause much less wear to installed pieces, so that if the runner is removed for use elsewhere there are not permanent wear marks every foot and a half as would be the case with rods. We also point out where the runner should start and ideally end on the stairway. In this video, the stairway is split (with an intervening landing) which made it imperative that the top runner not encroach into the landing since an additional rug is going to be placed there. As mentioned in the video, the runners used in the installation were originally longer, which meant they needed to be cut to properly fit the new home's back stairway. As we show, if attention is given to pattern matching, and the work of reducing the length is performed by a skilled artisan, the finished look is no less appealing than if the runners had been custom woven for the job. In fact, using existing runners and cutting them to length is much less costly, much less uncertain, and much less time consuming than ordering custom runners. If you have questions about any of what we demonstrate in this video, we invite you to call us at 215-794-2300.